The color have the ability invoke various emotions and memories in us. Here are some of the colorful images that I had captured during my journey across India and they reflect happy memories. Two people Rupam Sarma and Bhushavali promoted me to participate in this Capture the Color Contest by TravelSupermarket and share the colors with you all. This is ancient Jain Basadi on a hillock at Karkala, a small town in Karnataka. The ancient Chathurmukha Basadi built in the year 1586 looks very plain from a distance even though there are small carvings on the ceiling. The beauty of this pillared square structure is enhanced by the encompassing pure blue sky. Green: The Bangalore Palace modeled on Windsor Castle of England provides lot of photo opportunities. The beauty of magnificent structure is enhanced by the creepers that are growing uniformly on the walls of the palace. Yellow: On one of the weekends I was awaken by the chirping sweet sounds of the birds. I ran to the roof top with my camera to have a clear view of them. They were small yellow birds flying around from one branch to another. These birds against the green foliage looked great. 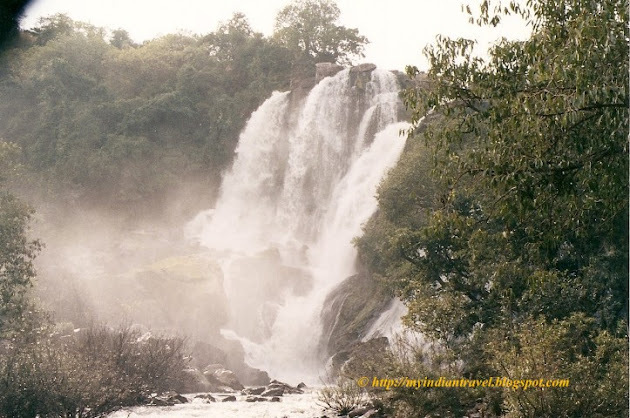 White: At Shivgange near Bangalore there are several beautiful water falls which fall from a height. The water gushing down with a force results in a splash. The beauty of the place can be enjoyed much only by looking at it through once own eyes rather than seeing it in a image. Red: While driving by road back to Bangalore after one of our short trips we got to see glimpse of setting sun between the mountains. The Sun was setting fast and I had to stop the car to get a clear view of gorgeous sunset. The sky was like canvas with various colors and prominent among them was red. I wish you all Happy participation and All the Best. Your photography is beautiful and makes me want to see these places in person. My travel budget this 5-1/2 month stay is radically depleted because I had to buy a brand new computer after mine crashed and my Android phone was dropped into a puddle by my rickshaw driver. That outlay of nearly $1000 US means I won't do the traveling about India I had hoped. It's a good thing I am living in Jaipur, though, with much to see and do. Lovely shots. All the best. What a wonderful and very colorful post! That first temple struck me because of its geometry - I like the lines and angles. The Bangalore Palace is magnificent. Love that wee yellow bird and the raging waterfall and especially the setting sun! Beauful sightseeing for me ! Great photos, all with great beauty, I love the colors and the light radiating nice, excellent framing. Greetings. Beautiful skies and an incredible temple as always! I do love the waterfall and the sunset is the perfect way to end a day! Thanks for sharing the beauty, Rajesh! Hope you and your family have a great weekend! What beautiful photos...so filled with lovely tones and contrasts. You did a marvelous job of capturing the colors of India. What lovely shots, especially the sunset! Fabulous. And what amazing green leafy pillars. Wow Truly amazing photography and post for 'Capture the Colour' All the photographs awesome.Thanks for the post.All the Best. Lovely series of scenes and photos. The bird is really pretty. Happy Weekend. love the green! and that sweet yellow bird! I love that green shot! It's a joy to see photos of India. Well I didn't know about Banagalore Palace but I do know - thanks. Hello Rajesh, All photos from grand waterfall, majestic temple, and gorgeous sunset to tiny bird are wonderful shots. I can almost hear the roar of the falls! That yellow bird is superb...great photo Rajesh. And the waterfall?!!!! Spectacular. Of course I always enjoy visiting with you and viewing your posts. Great shots - that castle could be an English castle complete with ivy! Isolating color has a profoundly interesting effect. I'm for blue! Captured so beautifully. Hopping by from Camera Critters. Nice pictures you show - I like them all. Beautiful shots and my favourite is the last one. Wonderful representation of all the colors Rajesh! I agree that waterfalls are hard to capture and usually better to see in person -- but your picture does a wonderful job of catching the beauty of the falling water. Wow some great pics here. A great series of photos. The little yellow bird is beautiful. Your yellow bird is called a 'wax eye' here in NZ. Love all of your colours of life. The little bird is so like our silvert-eyes in Australia. beautiful photos! i love the first one, its so historic. thanks for sharing! Thank you all for appreciating this color canvas.